With the current version of BeTheme (20.9.7) comes our early beta release of the Header Builder. 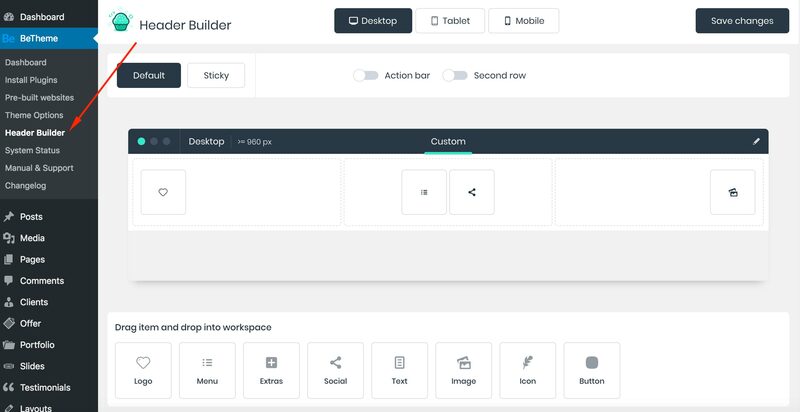 This tool will let you build your custom header without the need of adjusting anything in the theme options. Please remember that this is a beta version and the plugin is still in development so do not use it on your end products since many things may change until the final release. To install the Header Builder go to Wordpress > Betheme > Install Plugins. The plugin requires the version of BeTheme to be 20.9.7 or higher, so if you cannot install it, please update the theme. All posts that are not related to the Header Builder Beta will be removed. Generally speaking - this is a very good idea and I'm really happy to see it in BeTheme as this is one of three themes that I use for custom development. However, it's pretty limited in its present form allowing for setting custom headers with 3 rows and 3 columns each (at most). Why not simply use Muffin Builder's wraps? This would allow for complex header designs like this one. I believe it would make the header builder very powerful and generally unseen among WordPress themes. "This theme recommends the following plugin: _ BeTheme Header Builder - BETA." hi, i tested it but i want to revert and i seem to be stuck. when i go to the regular header preset it just directs me back to the header builder. how do i deactivate it? Is there a timetable for a production release? In new Header bilder why the height of the sticky menu depends on the height of the logo section, and does not have its own height? Header Builder Beta seems to be nice so far. But is there yet an option to change the menu font? Didn't see anything like this and selecting the font from BeThemeOptions is disabled. Bryan, thanks for the honest answer! Much appreciated. Question...hoping for some advice. I tested out the Header Builder and overall liked it but wanted to revert to one of the theme headers. All changes made, saved, caches cleared, and site loads ok on my mobile. Once I'm on mobile though, and click my logo link to go back to homepage, it keeps reverting back to the Header builder header....I have been trying to figure out how to stop this for the last couple of hours, but no success...any help is greatly appreciated. Everything is fine on desktop. When will it be possible to change the font size directly from the Builder?? On the header builder, can you please create a way to add widgets and shortcodes? Would make header adjustments that way much easier if we need to place a persistent item on the header across all pages. I actually need to do this for s client at the moment and it is proving a bit challenging. The mobile menu button is not working for the menu I built using header builder. I tried assigning two different menu's. I can click the button on my mobile phone but there is no menu popping up. Any fixes for this?